 Laboratory of Cell and Molecular Biology, Department of Botany, 35 Ballugunge Circular Road, University of Calcutta, Kolkata-700019, West Bengal, INDIA. Andrographis paniculata is an herb widely cultivated in South and Southeastern Asia. It has been traditionally used to treat infections and other Physiological disorders for several hundreds. 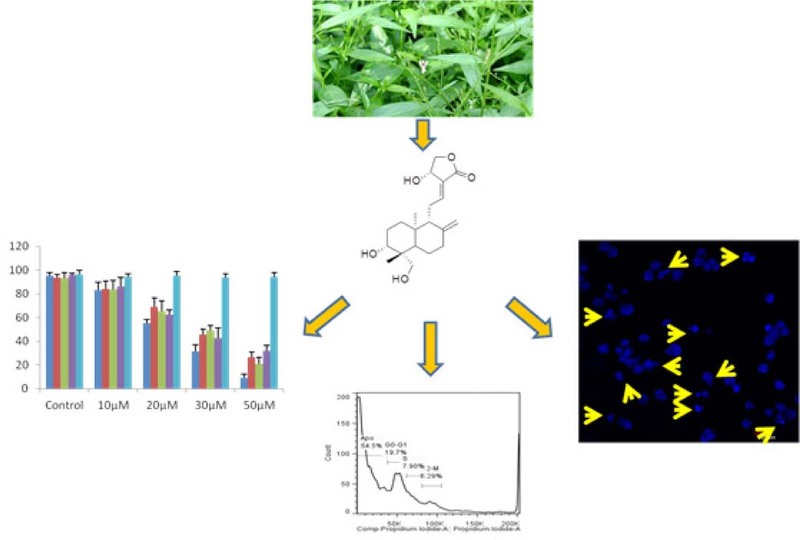 We investigated the anti-leukemic potential of Andrographolide (AGP) isolated from the leaves of this plant against an array of cancer cells to investigate its most efficacies in a particular cancer type. AGP was isolated from Andrographis paniculata leaves by using column chromatography. The structure was further determined by LC-MS, 1H NMR and 13C NMR. AGP was initially tested against four different cancer cell lines, namely NALM-6 (pre B-ALL), K562 (CML), A549 (lung carcinoma) and MCF-7 (breast carcinoma) using MTT assay at different time points and different concentrations. The effect of the isolated biomolecule was also investigated in inducing apoptosis through the study of cell cycle progression using flow cytometry by PI staining and nuclear fragmentation pattern by DAPI staining and fluorescence microscopy. the spectral analysis of the isolated bio-molecule assured that the compound was AGP. MTT assay data indicated that AGP was most potent to induce cytotoxicity in NALM-6 cells. Further investigation revealed that it effectively induced apoptosis by arresting cell cycle progression and increased the nuclear break down in NALM-6 leukemic cells. Our study efficiently demonstrated that the AGP isolated from Andrographis paniculata induced apoptosis in NALM-6 cells, which could be used in the therapeutic intervention of leukemia in the future. Leukemia is the most common childhood cancer and associated with increased proliferation and decreased apoptosis in neoplastic blood cells. According to Cancer Research (UK),1 9634 new cases and 4584 deaths occurred in 2014 from leukemia. Induction of apoptosis is the best strategy to destroy these malignant cells. These cells carry a number of mutations in their genome/proteome, that results in the up-regulation of anti-apoptotic proteins (e.g. Bcl-2, Bcl-XL etc.) as well as down-regulation of different pro-apoptotic proteins (e.g. Bid). Therefore, utilization of multi-target drugs is most important for treating leukemia. Now-a-days a higher percentage of commercial drugs contain active principles from natural sources, particularly from plants for its multiple targets and least side-effects e.g. Paclitaxel, Podophyllotoxin etc. Andrographis paniculata Nees. (Acanthaceae), commonly known as ‘Kalmegh’, is a wonder drug and very popular in ‘Aurvedic’ and ‘Siddha’ systems of medicine in India for its wide spectrum of biological activities.2 Three major labdane type diterpenoids to which the main biological activities of the plant are attributed, are Andrographolide (AGP), 14-Deoxy-11,12-didehydroandrographolide and Neoandrographolide (NAGP).3 AGP, the major diterpenoid of this plant, has hepatoprotective, hepatostimulant,4 anti-inflammatory,5 anti-viral6 and anti-leukemic activities.7 14-deoxy-11,12-didehydroandrographolide, the second major diterpenoids of this plant, has cardiovascular8 and anti-inflammatory9 effects. Anti-leukemic activity of this compound has not yet been established, although its anti-cancer activity has been reported in the last few years.10,11 In the present paper, we have isolated AGP (diterpenoids) from the aerial parts of Andrographis paniculata plant by column chromatography and repeated crystallization. The structure of the isolated compound was established by spectral analysis and screened against different types of cancer cell lines, namely NALM-6 (pre B-ALL), K562 (CML), A549 (lung carcinoma) and MCF-7 (breast carcinoma). NALM-6 appeared to be the most sensitive in response to AGP treatment in comparison to the other types of cancer cells, as evidenced by MTT assay. In this article we first time investigated the anti-apoptotic activity of AGP against NALM-6 which was established by cell cycle analysis and nuclear break down assay. 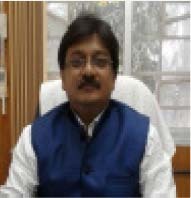 The leaves of the plants were collected from the Garmirjapur village of West Bengal during the September- October of 2014 and identified by Prof. N. D. Paria, Department of Botany, University of Calcutta. Plant materials were air dried in the shade at a 35°C-40°C temperature for several days, so that no residual water remains in the sample. Dried samples were grounded into fine powder (1kg) and stored in vacuum desiccator until use. RPMI 1640 and fetal bovine serum (FBS) were purchased from GIBCO/Invitrogen. Penicillin, streptomycin, DAPI, Propidium iodide and thiazolyl blue tetrazolium bromide (MTT) were purchased from SIGMA. Silica gel (100-200) and all the solvents, e.g. methanol, chloroform, petroleum ether used for column chromatography were purchased from Merck, India. 1Kg of powdered plant material of Andrographis paniculata was extracted with 95% methanol by a hot-extraction method using soxlet apparatus. The methanolic extract was evaporated using a rotary evaporator (BUCHI, Switzerland). Dried extract was defatted with petroleum ether. Defatted extract was subjected to silica gel (100-200 mesh) column chromatography (CC) and eluted with petroleum ether-chloroform mixtures (1:1 and 1:4) and chloroform-methanol mixture with gradually increasing polarity. 12 fractions were collected namely A-L. 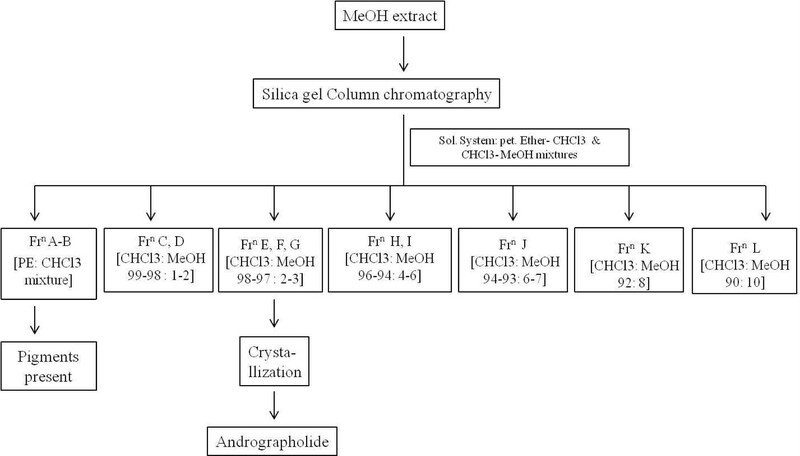 Fraction E, F and G were mixed up and subjected to CC using chloroform: methanol (98:2, 97:3) solvent system to yield AGP through repeated crystallization (approximately 1g) Figure 1. Pure crystals were colourless, solid, cube shaped and identified as AGP. Human cancer cell lines NALM-6, K562, A549, MCF-7 were maintained in RPMI 1640 media supplemented with 10% heat-inactivated fetal bovine serum (FBS), 100U/ml penicillin and 100μg/ml streptomycin at 37°C in a humidified atmosphere of 5% CO2. Cells were seeded at a density 1x105 cells/well in 96-well microtitre plate and treated with AGP at different concentrations for 24h and 48h time points. After treatment, 20μl of 5mg/ml MTT solution was added to each well and incubated for 4h at 37°C. After incubation, the medium was aspirated and formazan crystals produced in cells were solubilized in dimethylsulfoxide (DMSO). Absorbance was measured at 570 nm using a microplate reader (iMark, Bio-Rad, Japan). Results were expressed as a percentage of cell viability in comparison to control. NALM-6 cells in the exponential phase of growth were treated with AGP for 48h time points, then washed, harvested, fixed by 70% ethanol and incubated for 30 min in PBS containing 100µg/ml RNase and 50µg/ml propidium iodide (PI). For each sample, 104 cells were analyzed on a flow cytometer (FACS Verse, Becton Dickinson, San Jose, CA, USA). Results were expressed as the percentage of cells in each phase of the cell cycle. Cells were seeded at a density 1x105 cells/well in 96-well microtitre plate and treated with AGP at different concentrations for 24h and 48h. After treatment, cells were collected, washed with phosphate buffered saline (PBS) and permeabilized with methanol. DAPI (1μg/mL in PBS) was added and incubated for 15 min at room temperature. The stained cells were observed under a fluorescence microscope (Premium FL, Dewinter, Germany). 1H NMR (C5D5N, 300MHz): δ 7.18 (1H, td, J = 1.5, 7.0 Hz), 5.37 (1H, m), 4.88 (1H, d, J = 1.0 Hz), 4.85 (1H, d, J = 1.0 Hz), 4.60 (1H, dd, J = 6.0, 10.0 Hz), 4.50 (1H, dd, J = 2.5, 10.5 Hz), 4.43 (1H, d, J = 10.5 Hz), 3.64-3.60 (2H, m), 2.73 (t, J = 7.0 Hz), 1.90 (1H, m), 1.51 (3H, s), 0.70 (3H, s); 13C NMR (C5D5N, 75 MHz) δ 170.7, 147.9, 147.0, 130.2, 108.8, 79.8, 75.4, 66.0, 64.1, 56.3, 55.3, 43.2, 39.1, 38.1, 37.3, 29.0, 25.0, 24.3, 23.7, 15.2. MS (ESI) 373.23 [M+Na] + Figure 2. We investigated the anti-proliferative effects of AGP against different cancer cell lines. Each cell line was treated with and without AGP for 24h and 48h, followed by MTT assay. AGP exhibited cytotoxic activity against all the cell lines tested, but NALM-6 was most sensitive. The IC50 values of AGP at 48h of incubation to NALM-6, K562, A549 and MCF-7 cells were 17 μM, 25 μM, 22 μM and 21 μM respectively. We found that cell viability after AGP treatment was decreased in a concentration and time dependent manner at both time points. We also tested the cytotoxic action of AGP against normal PBMC and found that AGP did not show any significant cytotoxic action against PBMC Figure 3. We further performed the nuclear fragmentation assay and cell cycle analysis with the most sensitive cell line NALM-6. To investigate the underlying mechanism of anti-leukemic activity of AGP, we performed cell cycle analysis after AGP treatment (control and IC50 value) by using flow cytometry after staining with Propidium Iodide. AGP mediated apoptosis was evidenced by the elevated number of sub G0/G1 cell population in comparison to the control set Figure 4, Table 1. Occurrence of nuclear fragmentation, is one of the hallmark evidence of apoptosis. We performed DAPI nuclear staining after AGP treatment to NALM-6 cells to look at the nuclear fragmentation pattern. Results of DAPI staining indicated that exposure to AGP at IC50 values increased the number of fragmented nuclei and apoptotic body formation in the treated cells in comparison to the control set Figure 5. In the present study, we isolated AGP from Indian medicinal plant Andrographis paniculata in a new protocol. 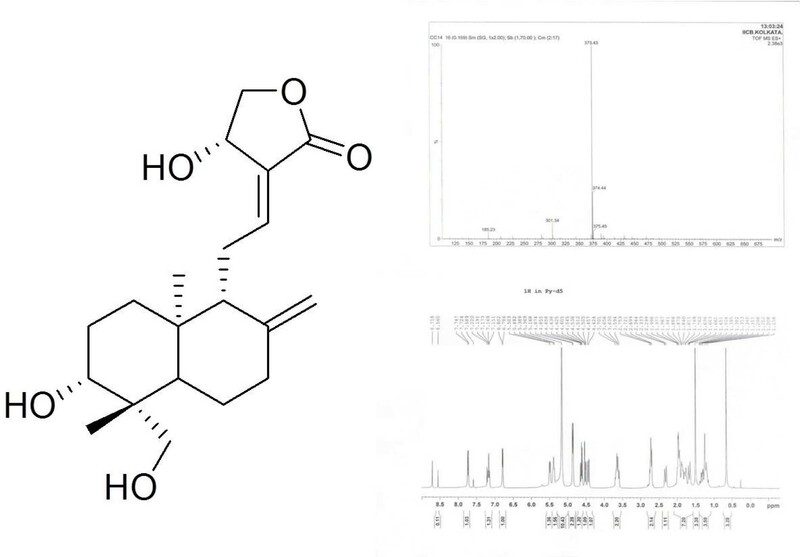 At first we prepared the methanolic extract of the leaves, as it is reported to possess the most promising anti-cancer properties.12 This methanolic extract was run through the column chromatography using a combination of solvent system and isolated pure compound by repeated crystallization. The structure of the isolated compound was determined by spectral analysis. Although extensive works have been performed to establish anti-cancer activity of AGP and its mechanism of action in several cancer types,13,14,15 anti-leukemic action of this diterpenoid has not yet been explored thoroughly. Therefore, we investigated the anti-leukemic activity of the isolated compound by studying its cytotoxic efficacy towards two leukemic cell lines viz. NALM-6, K562 along with A549 (lung carcinoma) and MCF-7 (breast carcinoma) as a positive control as it is sensitive towards the AGP.15 The result of the MTT assay showed a differential cytotoxic activity of AGP towards four cancer cell lines and NALM-6 was found most sensitive. Therefore, we further explored the mechanistic detail of anti-cancer activity of AGP against most sensitive NALM-6 cells. Apart from the anti-cancer activity, AGP interestingly exhibited nominal cytotoxicity towards the normal PBMC, which helped us to conclude that AGP has a potential to target the cancer cells leaving the normal healthy cells apart. Cell cycle arrest is one of the most promising evidence of apoptosis. Previous study entails that AGP effectively arrest cell cycle progression at G0/G116 as well as G2/M17 phase of the cell cycle. We performed cell cycle analysis of the AGP treated and untreated NALM-6 ells. Our result correlates with the Banerjee and her co-workers data and any G2-M arrest was not found. We further studied the nuclear fragmentation analysis because it is another hallmark event in apoptosis. We treated NALM-6 cells with AGP and after 48h of incubation period, we visualized nuclei under a fluorescence microscope after staining with DAPI stain. We found an appreciable amount of cells with fragmented nuclei in comparison to the control untreated cells. Schematic representation of isolation of AGP from the methanolic extract of Andrographis paniculata leaves through column chromatography. Chemical Structures of the isolated diterpenoid Andrographolide (AGP). Assessment of anti-proliferative activities of the AGP against NALM-6, K562, A549, MCF-7 and PBM cells at 24 h and 48 h time points. Each line graph represents Mean ± SD of three independent experiments. Cell cycle analysis of NALM-6 cells after AGP treatment. NALM-6 cells were treated with and without AGP (IC50) for 48h and stained with Propidium Iodide and analyzed by using a flow cytometer. In conclusion, we can say that AGP, a diterpenoid isolated from Andro graphis paniculata, effectively inhibited NALM-6 pre-B-ALL leukemic cells along with other cancer cells and thereby holds a great promise in its anti-leukemic potentiality and can be included in therapeutic interventions of leukemia treatment in the days to come. Andrographolide was isolated from Andrographis paniculata. 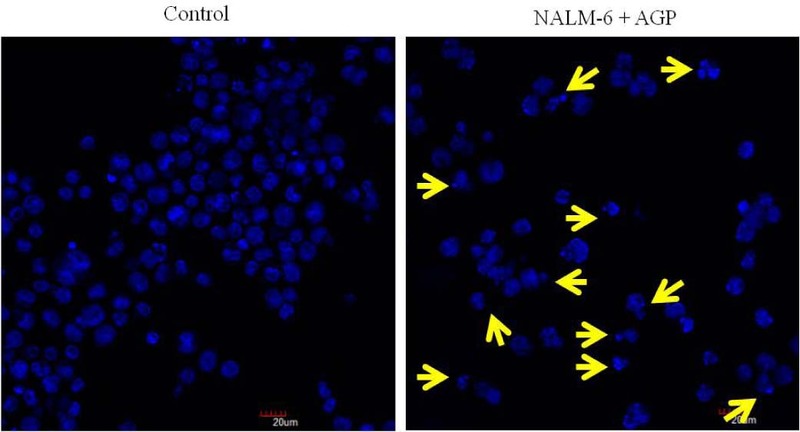 It was able to induce cytotoxicity in four different cancer cell lines, namely NALM-6, K562, A549 and MCF-7; among which NALM-6 was most sensitive to Andrographolide with IC50 values of 17µM. Andrographolide effectively arrested cell cycle progression at a G0-G1 phase in NALM-6 leukemic cells. It also induced nuclear fragmentation in NALM-6 cells, which was evidenced by DAPI staining and fluorescence microscopy. 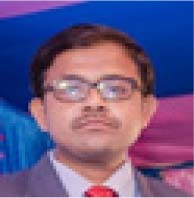 Swadesh Sarkar: Is an Assistant professor at the Department of Botany; Chandernagore College; West Bengal, India. 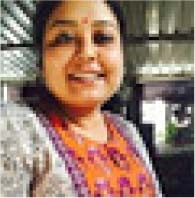 Priya K Gopal: Is a Senior Research Fellow of Laboratory of Cell and Molecular Biology at the CAS, Department of Botany; University of Calcutta; West Bengal, India.